With an SPC Marginal Risk in place across Virginia and a backdoor front dropping south across the state it was time for another June chase today after a quiet start to the month. Given the heat and humidity levels I waited comfortably at home watching radar until finally deciding to leave after 2:30 pm. A Mesoscale Discussion had been issued for strong storms but with almost no prospect for a watch issuance. CAPE was plentiful but shear – again – was very meager. With an intensifying rain/hail shaft blocking my way I turned back to a spot just west of Rte 122 (off Joppa Mill Rd) where I snapped this photo of the oncoming storm: As it rumbled in my direction it spit out lots of CGs (cloud-to-ground lightning strokes) so I wound up staying rather close to the chasemobile. I tried yet again to find another route east but the precipitation shaft on the southern cell had intensified greatly so I finally gave up on that idea. When the storm complex I’d been chasing kept developing on its southwestern edge I decided to push west on VA Route 24. I stopped briefly at Staunton River High School to watch before continuing west. I dove south of Rte 24 on rural routes and wound up at a farm entrance watching the western edge develop and head toward me. Given the outflowish structure of this cell I’m uneasy claiming this as a wall cloud but it certainly had the appearance of one. After waiting in the rain for what seemed like an interminable amount of time I rolled back north on Joppa Mill Road into dry conditions. Instead of calling it a chase I maneuvered into western Bedford county on rural roads. I wanted to find a vantage point from which I could watch (and live stream) the back edge of the convection. I never found an acceptable spot so I eventually gave up and headed back home. Along the way I passed through the Chamblissburg vicinity and noticed some tree damage on the sides of the road. Apparently both hail and high winds had passed through there, literally a couple miles west of where I’d been sitting at the farm entrance. None of these cells had been severe-warned but I was surely glad I didn’t feel the brunt of that storm directly! I didn’t really expect a late September chase especially since typically those involve tropical remnants and none were to be had. I had just gotten back from a week-long vacation in the western U.S. and was fairly worn out from that. But with a stationary front hanging around plus an upper level low perched west of the Appalachians the shear and instability proved too much for me to resist. By this time a severe-warned storm had bubbled up near Danville VA (earlier than expected). This cell was moving northeast so I doubled back south to 460, jogging east to Pamplin City where I dropped further south. At Charlotte CH it appeared that I couldn’t make a good intercept by pushing west to U.S. Route 501. Thus I continued south and then east along rural routes. Winding up on U.S. Route 360 I jogged east to Wylliesburg and then south on U.S. Route 15. Via Rte 15 I finally made it south to the U.S. Route 58 corridor at Clarksville where I turned west to find a good vantage point. A line of several discrete cells – most of them severe warned – was steaming northeastward and I finally found a spot a few miles west of Clarksville from which to observe the northernmost cell. As this storm moved (barely) north of me across the Kerr Reservoir a clear RFD slot formed behind it. After this feature cleared to the north I pointed my attention – and the chasemobile – south to storm #2 on the line. The hail core on this next cell was rolling directly toward me so after a few minutes I pulled up stakes and motored a couple miles southeast to another vantage point. Here I watched as the wall cloud and another RFD slot approached. Realizing that this feature was passing by to the south I checked radar and noticed a crease between storms #1 and #2 that promised rain with only possible small hail. So instead of continuing further east ahead of the line I doggedly headed into the crease, encountering heavy rain and “only” half-inch hail which I tweeted out to NWS Blacksburg. I never did find a decent vantage point even after pushing across the state line into North Carolina. I thus reversed course back north and then rolled west to U.S. Route 501 where I turned north again toward South Boston. I refueled there and continued west along Route 58 to and thru Danville. By virtue of my southern trajectory I missed the solitary tornado-warned supercell that crossed thru the Lynchburg and Appomattox area (where I had been several hours earlier). That storm went up west of the Blue Ridge and wrapped up tight when it encountered the shear zone along the stationary front. Can’t catch every storm! So after a chase of better than 300 miles and 9 hours on the road was it worth it? Yep! But I was one tired puppy when I got home. Chasing on Bastille Day (July 14th) wasn’t a sure thing but when early afternoon convection crossing the WV mountains held together I headed out. I tried to get a clear view of the action from the east side of the Roanoke valley – even winding up on the Blue Ridge Parkway for a bit – but was completely frustrated. Thus I continued east along VA Route 24, detouring briefly on a southeasterly rural road without much success at seeing anything. Upon reaching VA Route 122 I dithered on which way to turn. The convection was slowly moving north-northeasterly, with radar showing one nice-looking cell heading in the general direction of Bedford. Another larger complex was moving from the Rocky Mount area toward Smith Mountain Lake but I wasn’t convinced I could gain position on it. Thus I turned north and wound up at a rural viewing spot looking at the northern cell. Here I switched on the live stream and settled down to watch the action but booming thunder kept turning my attention toward the southern complex. When a leading edge circulation showed on that storm via radar I gave in to an itch to check out the southern stuff. Crossing Rte 122 I dove east and then south on rural roads before intersecting with VA Rte 24 just ahead of the rain. Motoring eastward I turned south again at the intersection with VA Route 43 and stopped at another vantage point to snap some more photos. Here I saw evidence of scud being pulled into the updraft south of the main rain shaft as plentiful CG’s (cloud-to-ground lightning) stabbed down not far away. When the rain got too close I pulled away again and rolled south on Rte 43 to a point near Woodford Corner (where I’d stopped to observe storms two days earlier). Realizing at this point I wouldn’t be able to get ahead of this complex without continuing to the U.S. Route 29 corridor I pushed back north to Rte 24 as large raindrops splattered on the windshield. I had a time limit on the chase since we had tickets to a local minor league baseball game that evening so I almost called it off at that point. However as I maneuvered back to Rte 24 once again and turned west I noticed a series of cells going up along a flanking line to the southwest. This entire section was severe-warned as well. Thus even tho’ I didn’t relish the thought of driving toward the busy Smith Mountain Lake corridor I dropped south on Rte 122. After trudging along in a plug of traffic I finally reached a pulloff with a vantage point from which I could see one of the southwestern cells as it slowly tracked right toward me. I had glimpsed lowerings underneath the base as I drove and another one was evident as I stopped: Other than a pleasant few minutes of observing the storm in a quiet spot nothing else occurred so I called off the chase at 4 pm to head home in time for the game. #vawx A very long and busy chase day! ≈ Comments Off on #vawx A very long and busy chase day! 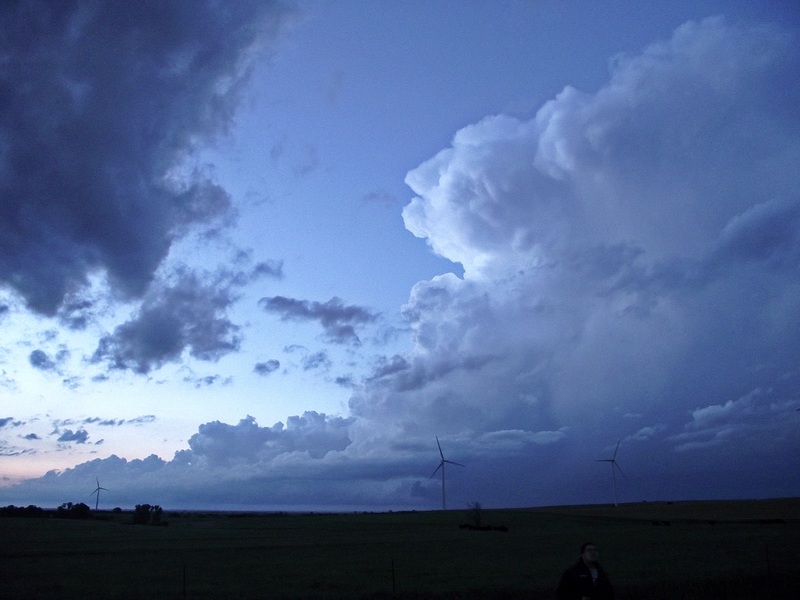 Given the convective setup I was decently excited about chasing Thursday June 23rd. The SPC had issued an Enhanced Risk for western parts of Virginia and the model parameters were looking good as a stationary front draped across the state. The fly in the ointment was the morning passage of an MCS (some hinted at a derecho) across the area. In the past that has been the kiss of death for chasing as the lower atmosphere gets overturned and afternoon convection is typically squelched. That turned out to not be the case this day. I took a quick jaunt out to a local vantage point to watch the leading edge of the MCS approach with an abundance of lightning and rain. After retreating to the house to avoid most of the rain and re-engage with the short term models I ventured back out to a hilltop vantage point in Botetourt county to observe an eastward moving convective line (and stop by a local coffee shop for a snack). None of the activity was worth photographing so I headed home once again to decide on the chasing potential plus a target. Thus my initial target was set as the Martinsville-Danville area along U.S. Route 58. But before I left for there I went to another local vantage point to peek at the still present convective line north and west of the Roanoke valley. Seeing nothing of note and feeling a cold outflow from the north I motored south and stopped at a rural spot east of Martinsville to watch and wait. I didn’t wait long as an updraft to my north caught my eye. Even though the visibility was fuzzy (high humidity) the cell looked to be sustaining a lowering under it: I watched for a few minutes before jumping back into the chasemobile, heading north to VA Route 57 and then northeast toward Chatham. This cell turned out to be a storm firing along the southern flank of the convective line and wound up too far north and east of me to catch. I pushed east of Chatham to a crossroads to recheck radar and satellite. 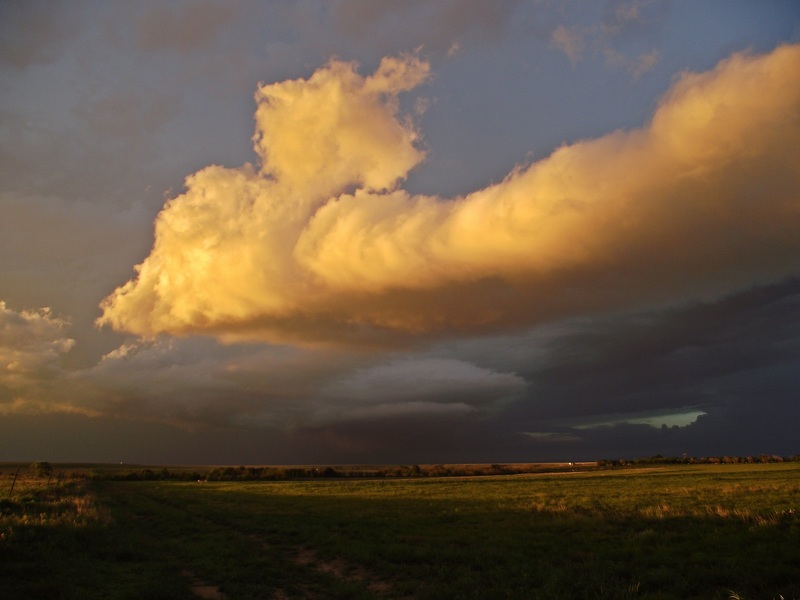 While there I noticed a fresh updraft to my west and my first thought was “Voila”! Rolling south and west via a rural road toward Tightsqueeze I stopped near an open field for this view: Very soon thereafter I noticed a lowering under the base that was partially obscured by the treeline (hey, this IS Virginia chasing after all! ): I quickly moved to a church parking lot just west of the trees and saw the wallcloud clearly: This cell wasn’t very impressive on radar at the time but I could hear artillery-quality thunder coming from the storm: Storm motion was southeast so the wall cloud was moving almost directly at me. 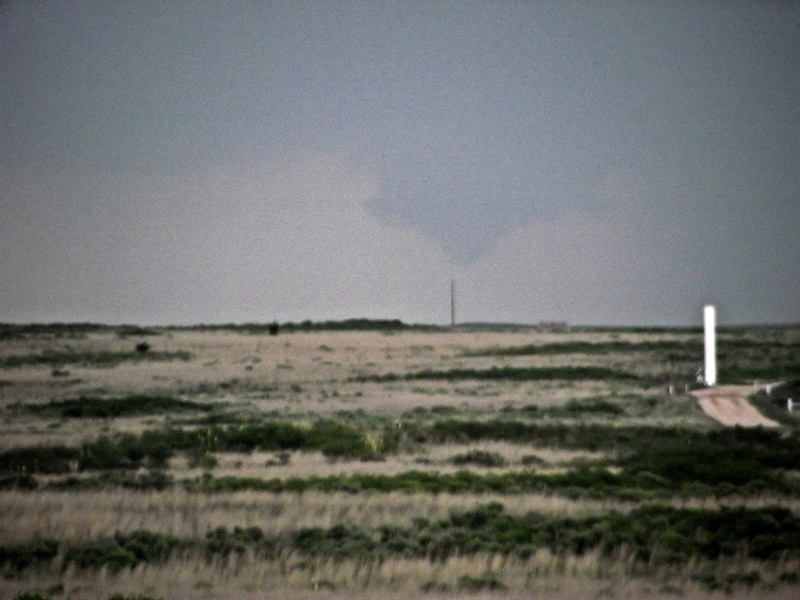 When it approached close enough I vaulted a mile or so east to watch and film some more: The feature was very obviously rotating and grew larger in size as it neared. I had switched on the live feed while at the church so it was pushing out video while I recorded it locally. To keep up with the storm I frantically divided my attention between keeping one eye on the action and perusing maps for potential rural routes. I eventually made my way to U.S. Route 29 and turned south, stopping now and then to snap photos and enjoy the view even though it was moving away from the highway. To stay near the storm I dove east to VA Route 360, speeding happily along until I came upon a recent traffic incident that completely blocked the two lane road with a number of passersby already stopping to help. After a couple of minutes it was evident that no traffic was proceeding in either direction (and likely wouldn’t for quite a while) so I did a U-turn to find another route to get back to the storm, confident that enough helpers were already on the scene. About this time I wondered out loud whether the National Weather Service would pull the trigger on a tornado warning (the storm was severe warned already). Thirty seconds later every alert I had with me went off confirming my wondering and all thoughts of abandoning the chase were gone. 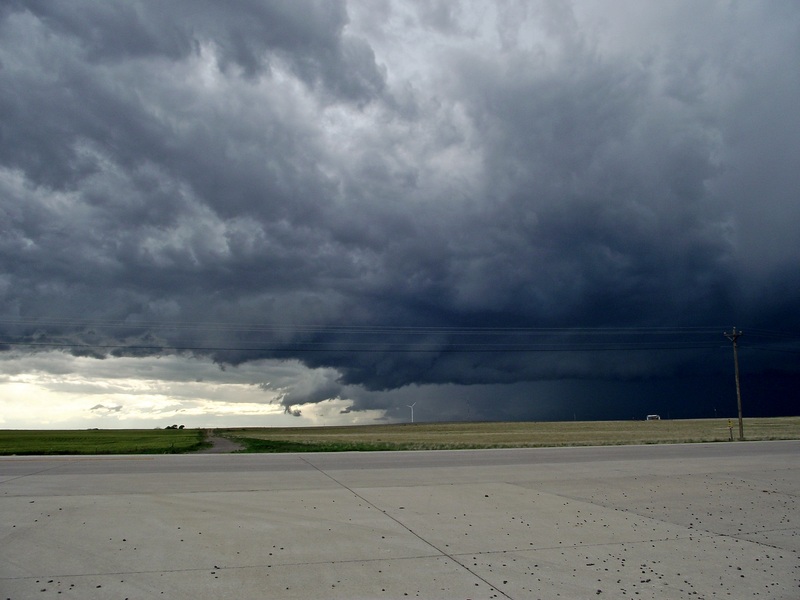 How could I drive away from a tornado-warned storm? Continuing along rural roads and straining to keep the storm in sight I found this spot in Halifax county VA from where I found myself peering northward under the mesocyclone itself: The rotation was visibly obvious but I didn’t dare get out of the vehicle as lightning was strobing down with alarming regularity. If there was a funnel or tornado at this point it must have been wrapped in rain as I didn’t see anything (neither did my dash videocamera). Apparently the local TV channel I chase for did a severe weather cut-in on this storm and used either my live feed or a picture that I’d send out via social media. After this stop I pursued the storm further and wound up getting way too close to the mesocyclone for my comfort given the trees and unfamiliar topography of the area.This was the radar velocity view at the time I came across some small twigs and leaves strewn across the road: Amid atomized rain – a sign of very strong winds – I did a U-turn and beat a hasty retreat back the way I’d come. I finally found a calm spot from which to watch the back edge of the storm, with one mesocyclone to my east and another one to the south: The video clip from this position shows awesome cloud motion and rotation that was thankfully moving away from me. This was my last chasing stop of the day but now it was my turn to get chased. The convective line that had remained north for much of the day had sagged south and I had to beat feet south to Roxboro NC to avoid a large hail core coming right at me. I sheltered under a gas station awning with thoughts of filling the chasemobile’s gas tank but the lightning was too close and too constant. Then radar indicated yet another mesocyclone and hail core coming toward me from the west so I left the gas station to pick my way northward up U.S. Route 501. I managed to avoid the worst of the storms but wound up detouring a good 40 miles out of my way home to do so. The last hour of the trip I plowed through heavy rain and lightning, all the more potent given that it was now dark. Home was a welcome sight!! Under today’s SPC Marginal Risk I didn’t expect much but was pleasantly surprised. 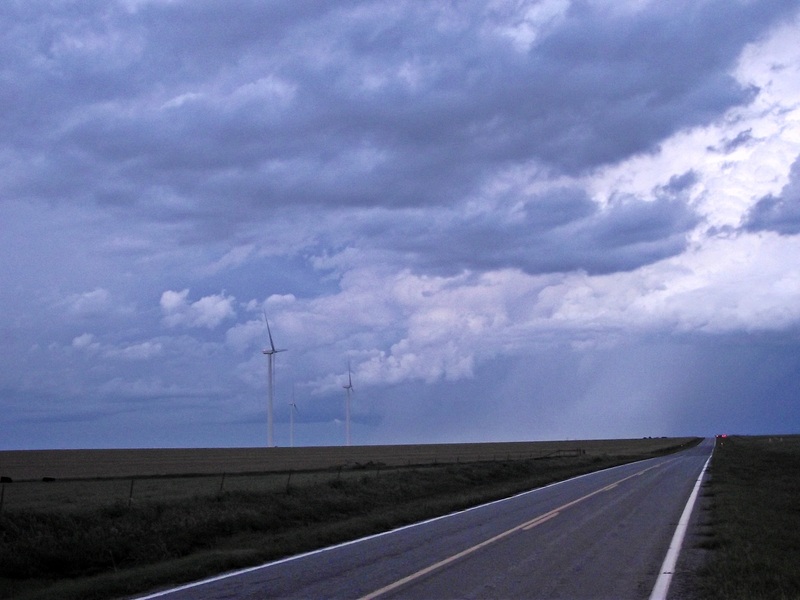 A warm front / wedge boundary was hanging between the U.S. Route 220 and 460 corridors as an upper level wind maximum approached from the southwest. My goal was to catch up with a storm that formed over the warm sector and then plowed into the shear zone over the frontal boundary and I did just that. A cell fired over the mountains west of Roanoke and promptly split, with the left split intensifying into a supercell and heading northwest across the Appalachians. From here I played leapfrog with the heavy rain via U.S. Route 460 eastbound, letting the storm pull ahead and north of me a bit before following. 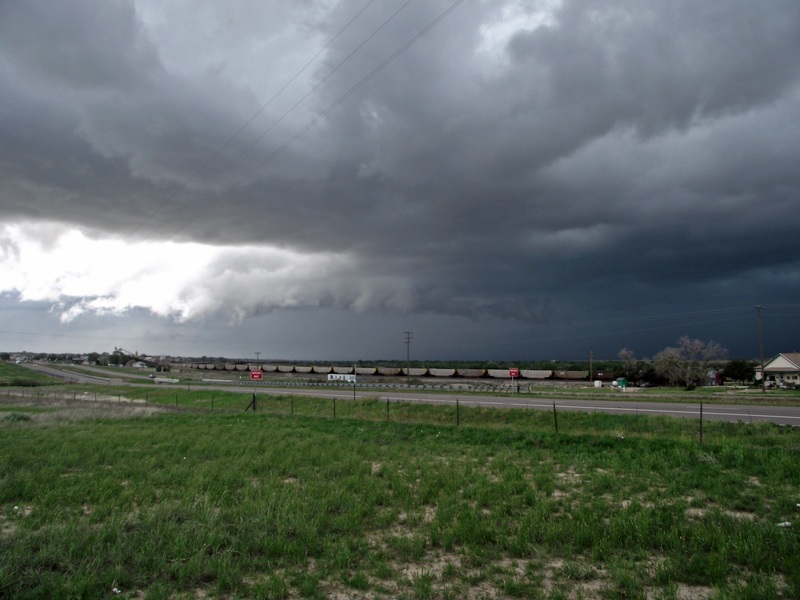 As I motored east of Montvale I stopped to catch this view of a wall cloud north of the highway. Continuing to the Bedford Visitor Center I had this overall view of the storm’s base as it began to weaken in the cold air north of the front. I followed the storm east via 460 but gave up on it as it began to look rather pitiful in the stable cold air. Then, amazingly enough, a severe thunderstorm warning popped up as it neared the outskirts of Lynchburg. Visually it was much weaker than it had been before the warning so I’m not sure what caused NWS Blacksburg to pull the trigger at this point. There was another complex to the south over Franklin county so I dropped down to VA Route 24 to check it out. However the business end of that storm was moving due east and it became apparent that I couldn’t get to it without core punching so I called it a day. My concerns about the timing of storms firing yesterday were confirmed as things didn’t ramp until almost dark in what I consider chaseable terrain. (If I’d been willing to chase west of the Blue Ridge mountains I would have had better timing but worse terrain.) What I didn’t expect was that the cold air damming wedge would not only remain in place but would advance further south than expected during the afternoon and evening hours. I managed to hold off leaving the house until mid-afternoon, winding up in Martinsville VA at 4 pm well ahead of any convection. Pausing at a local fast food establishment I perused the radar, satellite images, and surface obs while sitting in the chasemobile for a while. At this point the sun was shining between scattered low level clouds but surface winds were still out of the northeast, not a good sign for hoping the wedge would break down. By now I was tired of sitting around so I conducted a rolling reconnaissance to get a bearing on these cells, first heading west along rural roads to the hamlet of Horse Pasture on Rte 58 west of Martinsville. Even tho’ there were no radar returns I could visually see these cells were south and east of me so I reversed course on Rte 58 and rolled east of Martinsville. I promptly ran back underneath a gathering low overcast that provided more indication that the wedge was not only not going away, it was strengthening and pushing further south and west. Having lost the sightline to the cells under the cloud deck I dropped south along the Axton Road to Eden NC where I emerged into sunshine again. The towers were still well south of me so I diverted back north to Martinsville again, awaiting further development in yet another fast food joint parking lot. When an east-west line of discrete cells formed and held together on radar I pushed east of town again to set up between two storms. I was almost immediately greeted by thick surface fog that reduced visibility to a couple hundred yards. Continuing north on Rte 220 I managed to beat the main convective line to Rocky Mount where I pulled underneath a gas station overhang to wait out a couple of potential hail cores. I didn’t see any hail but there was plenty of lightning activity, with one CG striking close enough to make me jump as I sat in the chasemobile. March has come in like a lamb (if you ignore the light snow across the Old Dominion last night) so things are quiet now and look to stay that way for the next 10 days or so. Meanwhile I’ve had a chance to look over my data from the Feb. 24th chase. This was the wall cloud underneath the second storm as it headed right toward me. 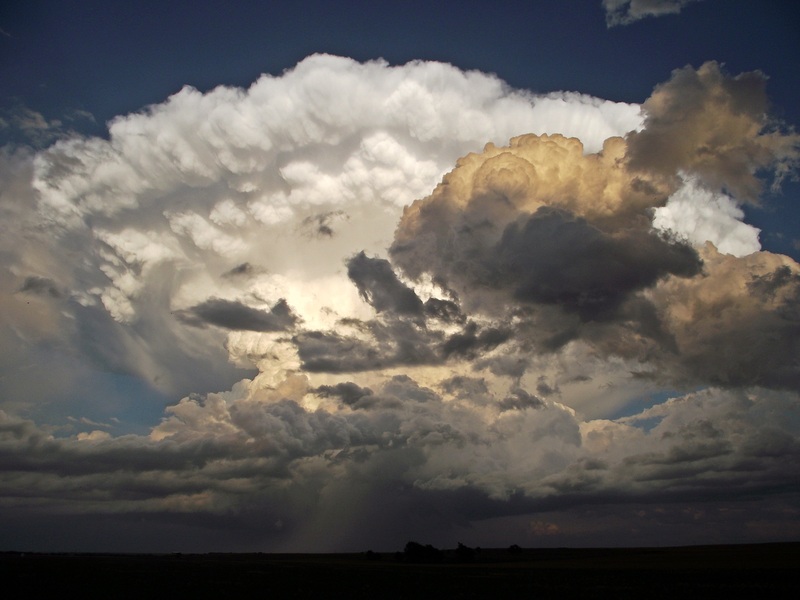 (Here is the link to a sped up video clip of this cell.) I had to egress to the east shortly after this photo was taken as the rain encroached on my location. I maneuvered on rural county roads between this storm and the third cell – now severe-warned – along the squall line over the next 30 minutes. This fourth storm along the line became tornado-warned at 3:59 pm, just over an hour after the warning above was issued. When this warning was issued I was racing east toward South Boston on U.S. Route 58. I had to give up on the severe-warned storm northeast of Danville (the 3rd storm in the line) to escape the approaching business end of this newly tornado-warned cell. The hail core weakened just before passing a mile west of me as I sheltered underneath a gas station awning near South Boston. I did keep going east toward Clarksville to check out the fifth storm (just south of the polygon above) but didn’t see a wall cloud as its core passed by a couple miles east of me. That was likely due to the mesocyclone being completely rain wrapped by this time. This was a very busy and exhausting chase. Even tho’ I saw no tornados I count it a major success in positioning, navigating, and observing. And I thoroughly enjoyed myself while providing ground truth for the NWS and TV broadcast mets! #vawx A February tornado outbreak! ≈ Comments Off on #vawx A February tornado outbreak! So the NAM was correct in screaming SEVERE today!! Things got very hectic today…and that was outside of chasing / seeing four (I think, after a recount!) separate tornado-warned storms. I initially headed for Danville and found that the wedge had broken just south of White Oak Mountain on Rte 29 when I broke into warmer air and clearing skies. I stopped at the NC Visitors Center south of Danville for a noon live stream for the local TV station. When that was done I made the decision to jog west toward Martinsville to take a gander at a robust north/south line of storms along the Blue Ridge mountains. After some (mostly unsuccessful) attempts to find open vantage points I swapped directions at the Rte 220 exit off the Rte 58 bypass around Martinsville. The line was pushing east and nearing my location, with each individual cell along it screaming northeastward at highway speeds. I figured the best way to “chase” was to stay ahead of the action and watch individual storms as they zoomed north along the line. 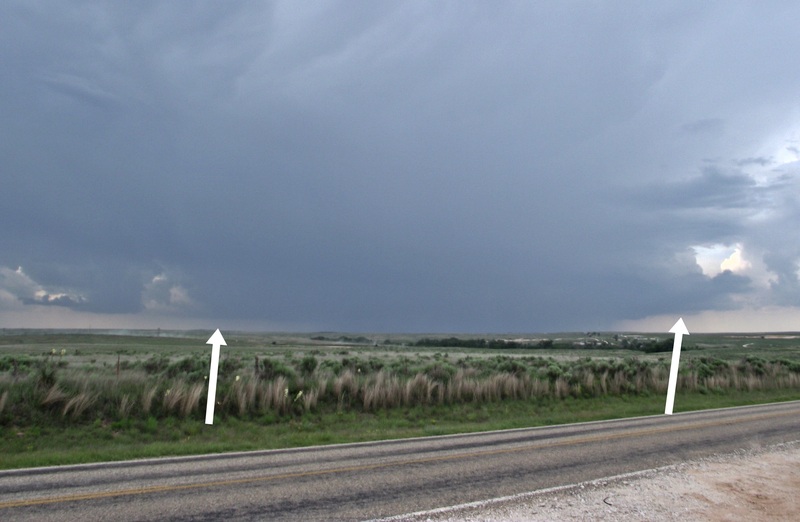 Lowerings are visible under the base and the main wall cloud – I think – is behind the hill on the right of the frame. 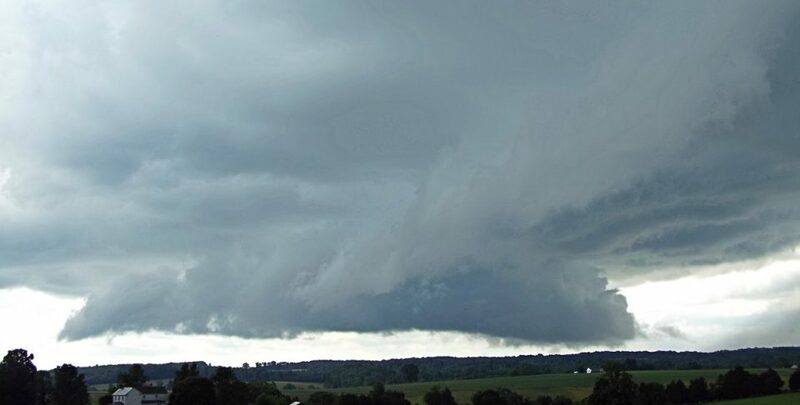 I called in a wall cloud report to NWS Blacksburg from this location. Since this storm was also tornado-warned I felt obligated to provide some ground truth as I had a smidgeon of time to do so. As I motored eastward from here my phone rang with a number from Georgia that I didn’t recognize. Thus I didn’t accept the call and kept driving, looking for the next road and watching both storms. Several minutes later during a stop to check the map I listened to the voicemail and found it was the Weather Channel wanting me to do a phoner with them! I called back and wound up doing the interview while stopped at the next road intersection. When that was finished I turned south toward Rte 58 again since storm #4 was headed my way (that was the storm near Greensboro in the radar grab above). Before I had gone 2 miles the phone rang again with a request for a phoner from the local TV station. I obliged them while I maneuvered my way along county roads and then turned east on 58. At this point storm #4 was just to my southwest and had a rather impressive hail core on it in addition to becoming tornado-warned. Thus I was very motivated to stay ahead of it and not get clobbered. While I sped east toward South Boston the phone rang yet again, this time with a request from another local TV station (this and the Weather Channel request were related but that’s another story) for an interview. I did that phoner without stopping since any hesitation would have meant getting steamrolled by the core. Not long after this I pulled off the highway and evaluated the situation. With the storms now rain-wrapped it wouldn’t have been fruitful to keep going east. That, plus the fact that I was ravenous (no lunch) dictated a prudent ending to the chase. Introduction: On the bitterly cold Valentine’s / Presidents’ Day weekend of Feb 2016 I finally decided to write up my 2015 Virginia storm chasing results. This discourse is the result, written partly as a sop to winter-induced cabin fever and partly as a desire to preserve the memories. Rather than repeat the format of previous writeups I have delineated each paragraph by date. March 26th: A cold air damming (CAD) wedge supposedly eroding ahead of an approaching cold front sounds like a questionable chase setup but I bit on it anyway. It was late March and I had a desperate need to get back on the chase trail. The successful part of the jaunt was in checking out this year’s chase gear, including a live stream demo for the 5 pm broadcast of the local TV station from a static position near Wirtz VA off Rte 220. What wasn’t so successful was seeing anything worthwhile. April 3rd: After several days of promising model results the morning HRRR runs showed a decent potential for storms east of the Blue Ridge. Even the SPC got into the act, upgrading their Day 1 outlook from a “Marginal” to a “Slight Risk”. Unfortunately we were all wrong and nothing severe occurred even tho’ I wandered over much of Bedford county while waiting for the action. The SPC reports for this day show a big blank over the entire Old Dominion. The storm was warned for large hail and contained visible greenage so I grew a bit nervous as I waited for the TV broadcast to finish. I did manage to get back ahead of it but was cut off by heavy rain from a path eastward to the Rte 29 corridor. Thus I stopped at a spot where I was relatively certain I wouldn’t be pounded by hail and conducted a static core punch before heading home. I was no longer 0 for April!! Despite the fact I was in good position to chase this cell I expected it to fade quickly as most left hand splits do. Thus I pulled off this storm and rapidly headed south and east to intercept the right hand split, which was now tornado-warned. Unfortunately this cell – as per most intensifying right hand splits – had turned right and was now steaming almost due east, still in North Carolina. I backtracked toward South Boston in an attempt to keep up with the new right hand split but gave up the chase since (a) the storm was really whistling along to the northeast and (b) I really needed a potty and dinner stop! April 22nd: This day’s chase was undertaken in very marginal conditions and I knew it…I just couldn’t resist. I started in Bedford county along Rte 122 and gave up after 45 minutes yielded only a little convection that went up briefly along an old outflow boundary. Heading back into the Roanoke valley I watched a couple more cells behind a cold front but neither one contained any lightning. What had tempted me to head out? Cold air aloft – meaning steep lapse rates – and insane shear values. April 30th: Another cold pool generated under an upper level low tempted me to head out again this day, albeit with little or no CAPE or shear to contend with. My expectations were of storms with small hail and some structure and that’s pretty much what I witnessed. I wound my way to a point east of Danville and just south of Rte 58 where I watched and live streamed a cell to my south. When that convection passed my longitude I pulled up stakes and headed west to check out some activity near the North Carolina visitor center just off Rte 29. I live streamed this action for the end of the 5:00 news broadcast and the beginning of the six o’clock news before pulling away from this storm. I’d planned dinner in Rocky Mount but diverted to observe yet another storm north of Rte 40 under which I saw a hail shaft. It had some indicated rotation on it but not enough to tempt me to follow it further. May 11th: The near approach of remnants from Tropical Storm Ana plus an approaching cold front resulted in a two phased chase on this Monday. I first drove south along Rte 220 to a south of Martinsville VA to intercept some cells that went up along the Blue Ridge mountains. I did observe some convection there but as it faded I moved further east along Rte 58. 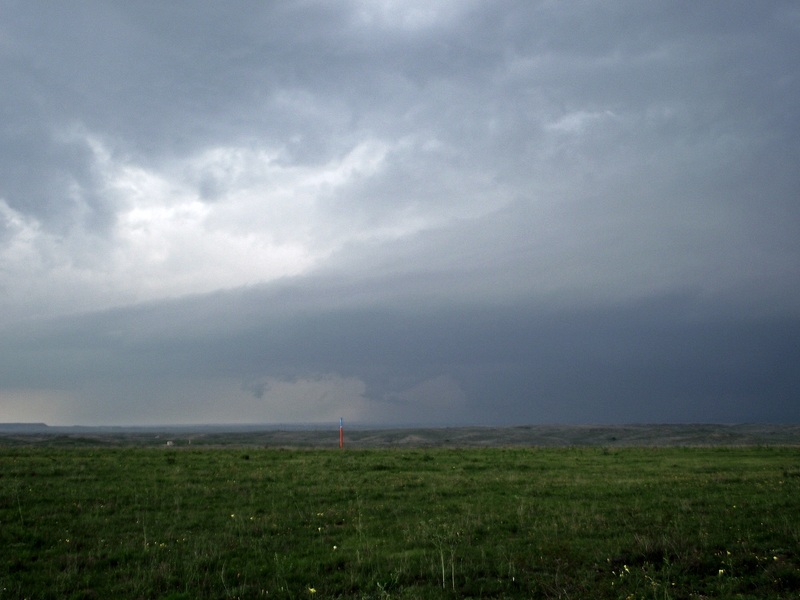 Finding a quiet open hilltop north of the highway off a county road I live-streamed a view of a weak-looking wall cloud that was picked up during the local TV station’s five pm broadcast. However this cell dissipated and I was a bit dismayed at the bright blue skies to my east thanks to subsidence behind the departing tropical remnants. Looking northward I could see an anvil from a storm more than 90 miles to my northwest over the Shenandoah valley. Thinking this might represent the leading edge of convection from the approaching cold front I decided to pull up stakes and motor northward. Grabbing a quick dinner in Gretna I continued north on Rte 29 toward the Lynchburg vicinity to intercept a cell that was crossing the mountains near there. Sure enough this storm became severe-warned so I diverted east at Yellow Branch, thinking I would head northeast to Rte 460 near Appomattox. The storm had other ideas and turned right to a southerly direction. Inflow bands also developed east of the storm during at least one cycle, and I saw what looked like a hail shaft at one point as well. When sunset neared I headed back home, driving under another cell with heavy rain and frequent lightning that eventually became severe-warned after dark. Our convoy of three minivans and eighteen chasers departed Blacksburg on time (0900) Monday morning May 18th to head out to the Great Plains. Little did we know the magnitude of the logistical challenges we – especially trip leader Dave Carroll – would face during this venture. The initial hint came during the first fuel stop in Tennessee. Two of the three VT Fleet Services gasoline credit cards wouldn’t work, so Dave pulled out his phone and eventually found out the cards had never been activated prior to their being handed to us. Thus a 15 minute gas stop turned into an hour and a half interlude. Another – chronic – problem was keeping the chase computers supplied with mobile internet access. Dave had purchased data cards with which to add balances to the accounts but each time the resupply required a lengthy phone call to the mobile data company…something not in the national advertisements. Just south of Chickasha OK we pulled off the interstate to seek shelter as a large hail-bearing cell loomed in front of us. On radar the biggest hail size looked to be windshield destroying stuff so we plunged underneath a bank overhang – after asking permission – with enough vertical clearance to allow us and our rooftop mesonets to fit underneath (an important point to keep in mind regarding events later that night). That intermission lasted a half hour or so before we poked our collective noses out from underneath shelter. Splashing through the flooded streets we made our way back out to the interstate and continued southwestward. Unfortunately our delays, the lack of a cap, and the high precipitation (HP) nature of the plentiful storms all combined to frustrate our chasing attempts this day. We pulled off I-44 south of Lawton to watch radar and noticed a tornado-warned storm to our southwest. Stopping in a church parking lot east of the interstate we were in hopes the cell would cross left-to-right in front of us. 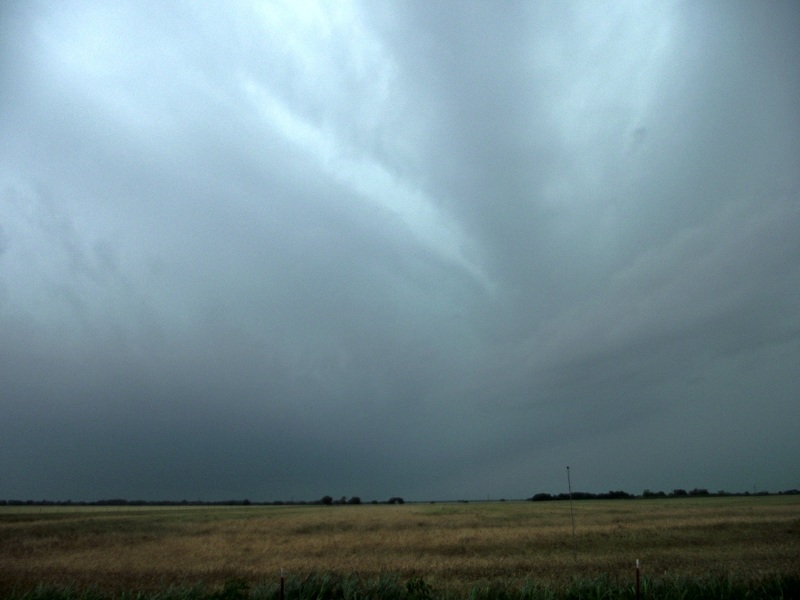 However, even though we could see curved cloud bands overhead flowing into the storm the HP characteristics obscured our view of the inflow notch. As the rain approached we retreated eastward and southward, bound to pavement by the very wet conditions in southern Oklahoma. The overall road network in this region is fair but many of the soggy routes we would have taken were dirt or gravel and were thus impassible for our minivans. Thus we began a series of eastward and southward dashes, first in an attempt to see the business end of several storms and then eventually to escape the growing squall line / MCS. Several hours of this bobbing and weaving added to the general exhaustion of the group and we eventually booked rooms at a hotel in Ardmore to settle down for the night. However Nature wasn’t through with us this day. After everyone found their rooms Dave and I kept watch on radar as we felt it was likely that we’d have to move the vans under cover somewhere to avoid hail from oncoming cells. The good news was we didn’t do that. 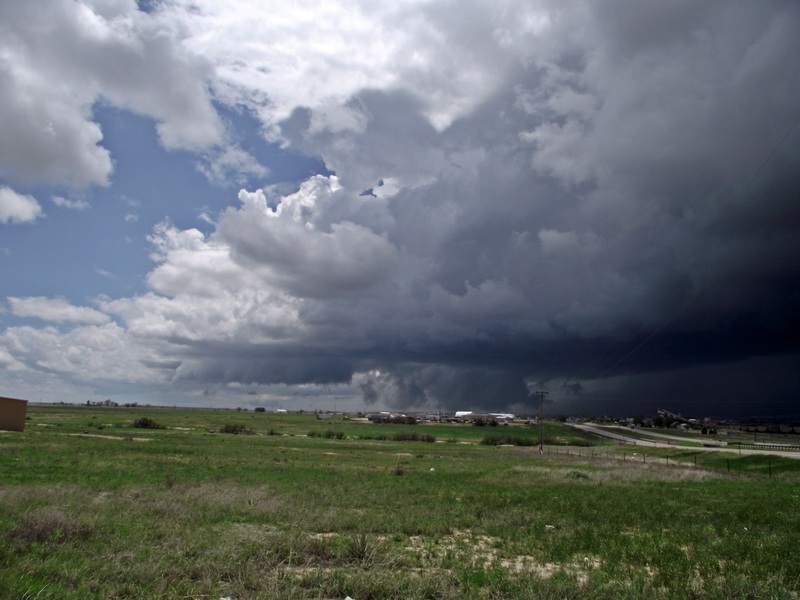 The bad news was that a storm moving directly toward Ardmore became tornado-warned. We therefore gathered up all the chasers – including a few that had trudged through the rain to a nearby restaurant – and drove 20+ miles south of town to watch this storm blow through from a safe distance. The snail-paced storm finally cleared Ardmore after a couple of hours and we drove three vans full of very tired people back to town amid heavy rainfall and a nocturnal lightning show. Dave peeled off to stop by the restaurant and let the students pick up their paid for (but not yet eaten) meals. Meanwhile the graduate student driving the third van went to the hotel with me to discharge our passengers. The grad student had eaten something for lunch that disagreed with him so he was not only tired but not feeling well. Even so he wanted to be helpful so he intended to drop off his crew underneath the hotel overhang to avoid the rain. Unfortunately that overhang wasn’t anywhere near tall enough to allow the mesonet to clear and the latter was almost totally removed from the top of the van. 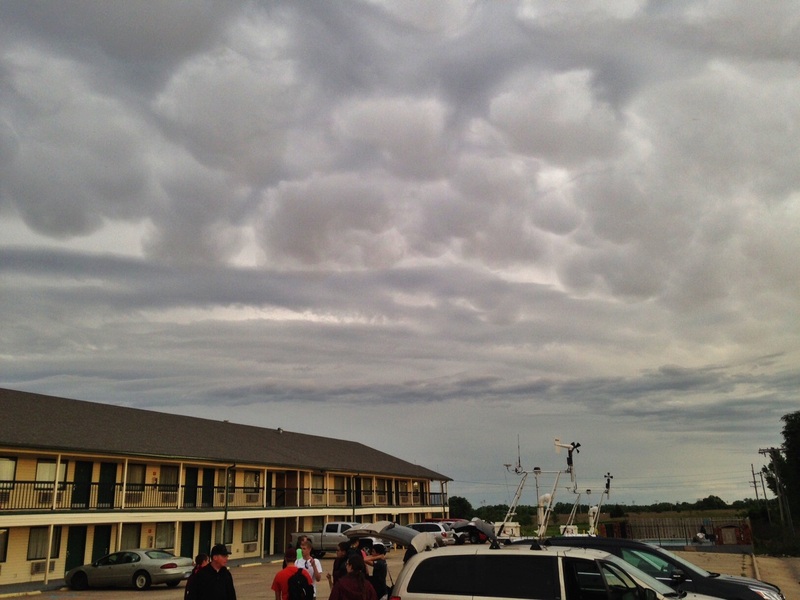 Fortunately neither the van nor the hotel suffered any discernible damage but the mesonet roof racks were toast. The next morning Dave was afforded the chance to exhibit his considerable “MacGyver” skills as he concocted a method to strap the mesonet on top of the third van using materials from a neighborhood sporting goods store. This arrangement actually worked pretty well and lasted the remainder of the trip, but devising and installing it required Dave to arise very early on the third day of the trip to get us back on the road. That too, added to the challenges of the trip. Wednesday the chase thus started a bit late but it wasn’t a big deal as conditions weren’t looking great. We motored our way south into Texas, diving south of I-20 to the village of Comanche southwest of Ft. Worth. Our plan was to intercept a triple point created by an outflow boundary and the dry line in hopes that the combination would fire up convection. To keep it simple…we busted. Calling off the chase early we traveled northwest to Abilene TX where we spent the night. Thursday May 21st proved to be the nadir of the trip. The previous day the transmission in my van had made a couple of suspicious “clunks” while slowing to a stop. Since nothing else happened untoward my eyebrows slowly lowered and I gave it little additional thought. Thursday our plan was not to chase but to reposition for storms in southeastern Colorado on Friday. So we leisurely drove from Abilene up through the Texas panhandle to Amarillo. In that city we had to go through a series of traffic lights that put us in stop and go mode for several miles and the van’s transmission really didn’t like it. A strange “zipping” noise began to occur every time it changed gears. But once we got back out on the open road it settled down…for a short while. However the problem quickly grew bad enough that my copilot both checked the Web and texted his brother back home. With that info in hand we determined that this was indeed a serious problem. My copilot then checked and found that the next town, Dumas, contained a Chrysler dealership. So I had the unhappy task of radioing ahead to Dave that my van needed to be looked at. Now late in the afternoon the dealership said they could take a look at it in the morning (Friday morning of Memorial Day weekend). So we made an unplanned overnight stop in Dumas and Dave took the van in to the dealership first thing Friday morning. Long story short: the transmission was shot and needed major repairs. Of course nothing could be done over the holiday weekend so Dave pulled another rabbit out of his hat of tricks and I drove him back to Amarillo where he rented a six passenger SUV for the duration. After overnighting once more in Dumas (the hotel was pretty good!) we set our sights for Saturday May 23rd on Colorado once again. We stopped briefly near Springfield but things looked good further west toward the Rockies so we jumped on a westward leading route to intercept. As we drove we could see some awesome towers going up and we turned north near the hamlet of Kim. This route paralleled the storm motion and I began to feel really good about our intercept chances. The road led through some incredible scenery which included mesas and small canyons but the excitement in the vans ratcheted skyward when a large wall cloud formed underneath the cell we were targeting. Finally reaching La Junta we quickly filled gas tanks and utilized restrooms before retreating a couple miles east of town to a vantage point. As we watched the storm went tornado-warned and sirens began sounding in the area. About this time someone reported a tornado on this storm in the general direction of the above photo. I have serious doubts that one actually occurred. The one photograph I’ve seen purporting to show the tornado was actually of the wall cloud we were watching at this time. Since then I’ve seen a video of dust kicked up by the rear flank downdraft that someone has used to claim there was a tornado. I’m really not a “tornado snob” but this one just didn’t happen. We leapfrogged east of this storm for quite a while. At one point the inflow was so strong it was sucking up ground level dust and yanking it into the updraft. We kept ahead of the cell until it merged with others to form a squall line. 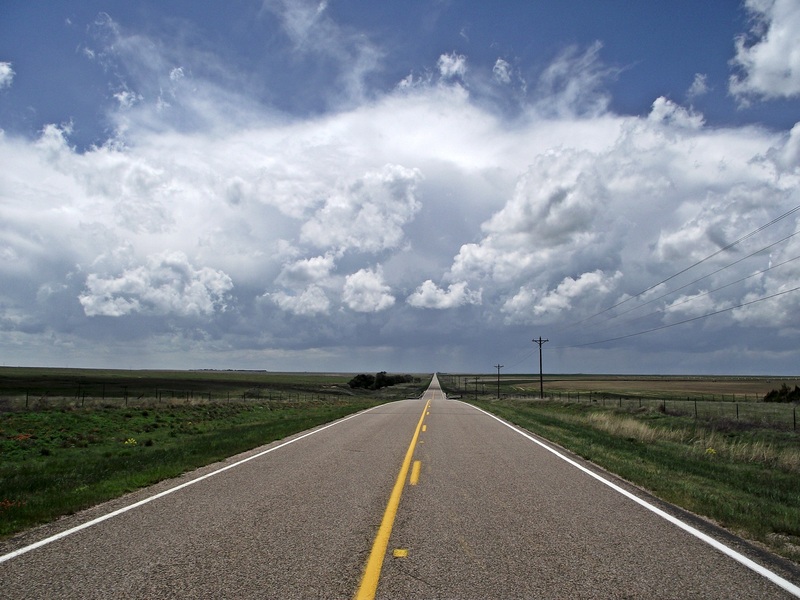 At that point we pulled up stakes and continued east into Kansas before diving south of the line to overnight in Guymon OK.
Sunday May 24th dawned cloudy and cool, typical of the first half of this trip. I think it was this morning the next logistical snafu arose. Dave discovered that his credit card suddenly wasn’t working. The finance company had sent a new card (one with the new embedded chip) to his home and immediately activated it while canceling the old one he had in his wallet. Rectifying this entailed another hour or so on the phone while he convinced the representative on the other end that he really wasn’t in a position to retrieve the chip card. Although this cell looked good a number of other storms were popping up (no cap) and merging into a line so we decided to play the southern end. Moreover a number of other chasers were up north near Lamar and we wanted to avoid chaser convergence as much as possible. Thus we motored back south to Boise City OK to watch and wait until the “Tail End Charlie” cell took shape. When it began looking healthy we stayed with it, witnessing a wall cloud underneath the storm’s base. As the cell continued its northeasterly drift we jumped in the vans and headed back north to Springfield where we turned onto an easterly route. We leapfrogged for a while ahead of the building convection and stopped literally on the Colorado / Kansas border to observe. 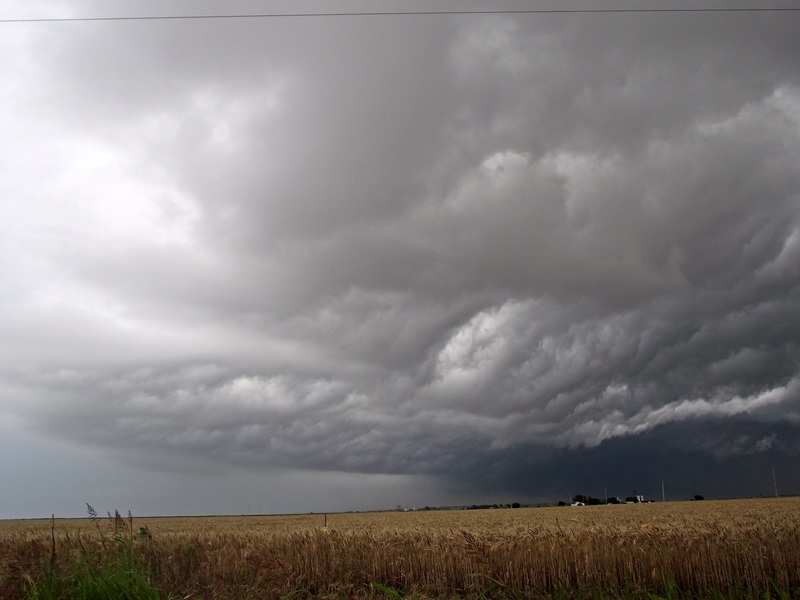 Continuing east and south into Kansas we oohed and aahed at the structure as more storms built ahead of the line. 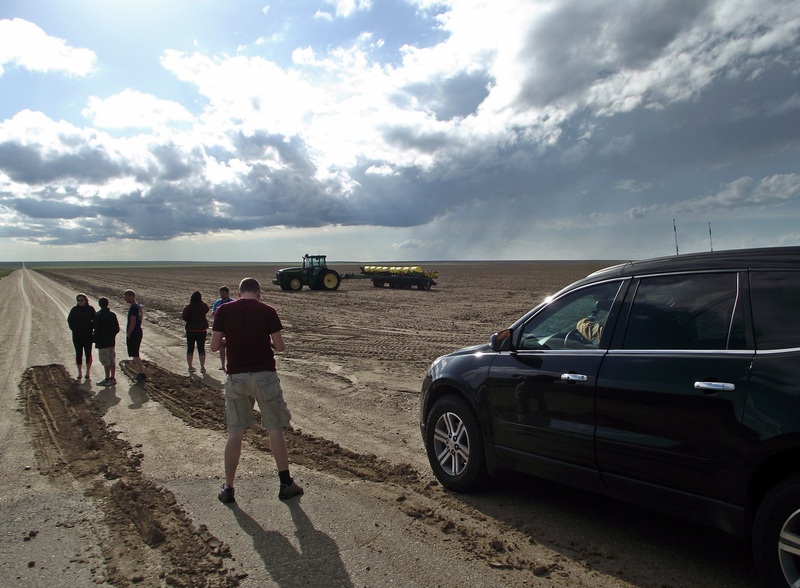 At one point we were faced with plowing underneath a developing cell or stopping to let it cross our path and risk getting clobbered by very large hail from the storm behind us. We chose the former option and had to punch through hail that was “only” half-inch in diameter. This storm was summarily ingested by the main cell behind us, creating some eye-watering structure that I missed since I was driving away from the merger. 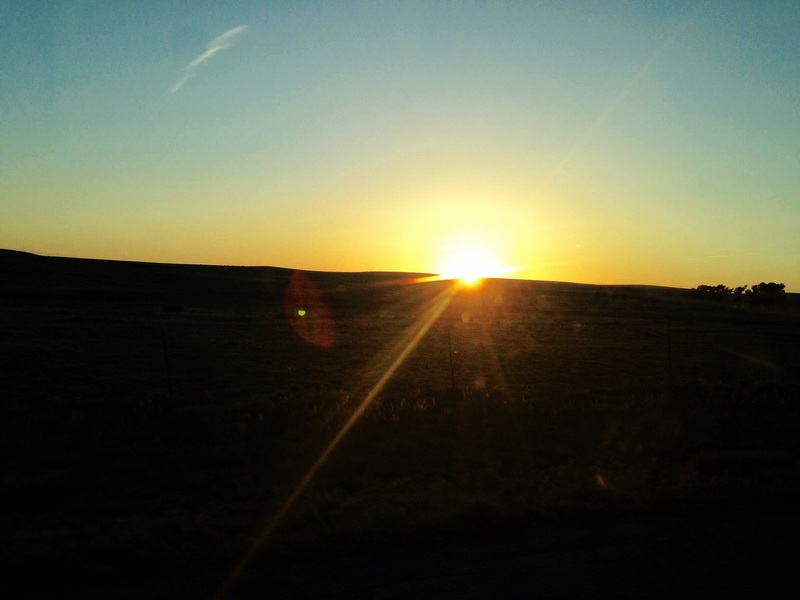 As darkness fell we pulled away from the action and rolled back south to spend a second night in Guymon. As we did so one of the storms to the east dropped a nocturnal tornado that some folks excitedly reported as a large wedge. The National Weather Service official survey conducted the next day rated it as an EF-1 so, again, I had my doubts as to the veracity of the preliminary tornado reports. Monday May 25th – Memorial Day – wasn’t really a disappointment in that we weren’t expecting much from the setup to start with. Departing Guymon OK we maneuvered northeastward toward Great Bend in central Kansas. CAPE values were off the charts but shear was in short supply. Stir in very little capping plus cold air aloft and hail storms eventually erupted all over the map. After determining that Great Bend wasn’t far enough east we pushed further to the town of Lyons where we enjoyed a mid-afternoon lunch/dinner stop while waiting for the convective picture to become clear. A nice looking discrete cell did go up east of Lyons but we were wary of chasing it. A number of other storms had popped up to the south and we didn’t want to get caught in a squeeze play amid multiple hail cores. Thus we sat still for a while until an outflow boundary fired some activity almost overhead. 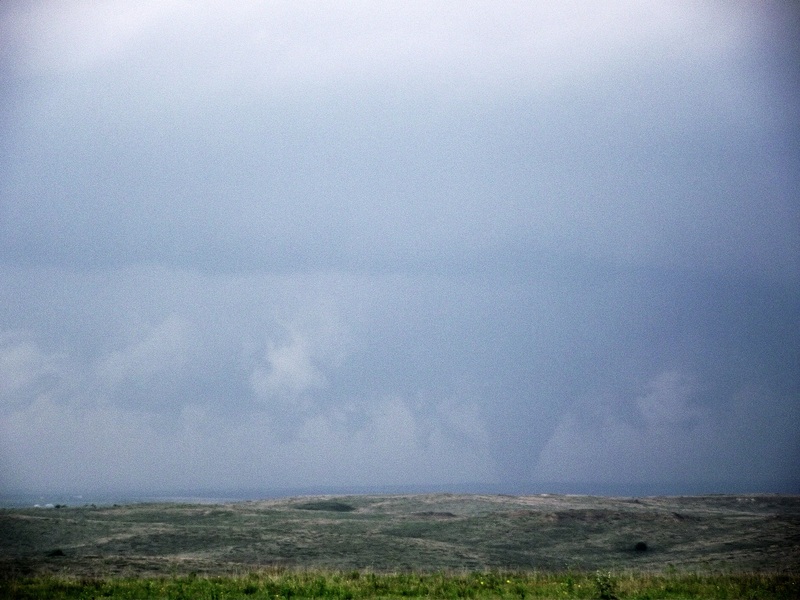 We then retreated a couple miles west of town to watch and wait. After the “Tail End Charlie” cell on the developing line crossed the road east of Lyons we piled back in the vans and headed after it. Unfortunately the rural road network in this part of Kansas is composed chiefly of unpaved roads and the monumentally wet conditions once again dictated that we remain on paved surfaces. In addition by this time the storms had begun to coagulate into an MCS and chasing that mess was untenable. So we called it a day and headed to Pratt KS (yay!!) to overnight. We were all hoping the evening sun would dip below the clouds to provide underlighting for these features but such was not to be. The next morning – Tuesday May 26th – dawned bright and clear and I managed to squeeze in a leisurely stroll before our morning forecast meeting. Given the setup we reluctantly set our sights on southwestern Oklahoma hoping that area would be slightly less water-logged than points east of there. Diving into the Sooner state we continued south to Frederick to set up. Parking on a ridge top east of town we watched a couple of cells go up to our west. 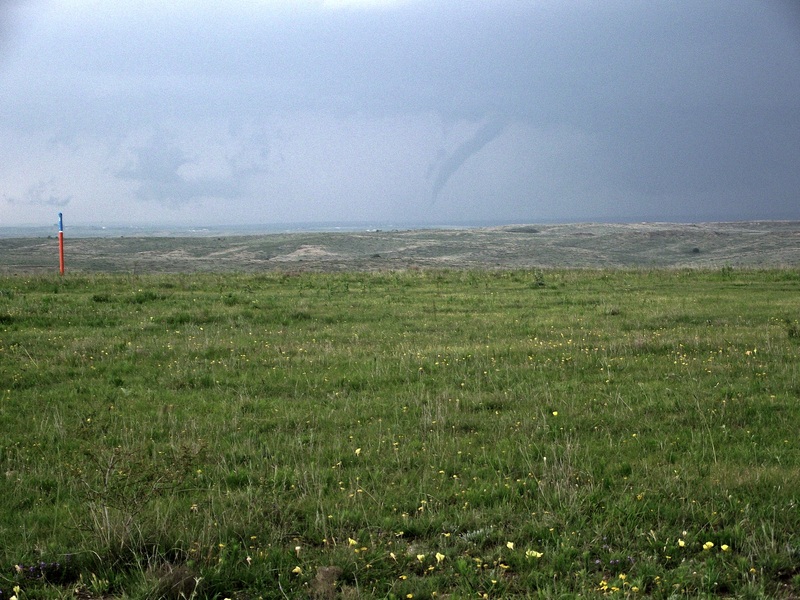 The left hand cell became severe-warned and actually produced a horizontal tube vortex which reinforced our assessment of the tornadic potential in this area. It was touch and go for a while as to which storm we would chase. When the rain shaft under the left-hand cell shrunk substantially we actually headed back west toward Frederick to go after the right-hand cell. 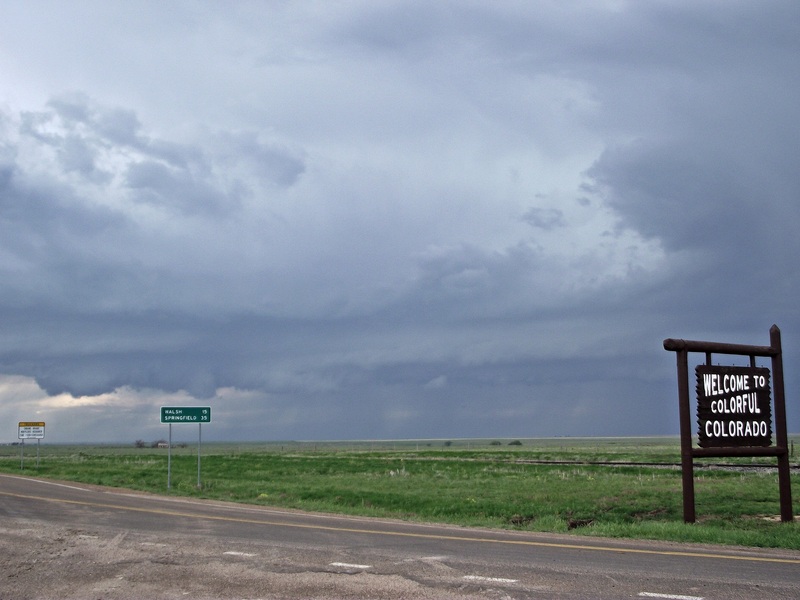 But as we approached town the former storm quickly pulsed back upward and we reversed course to get out of the now-growing rain and hail shaft. Motoring east amid the rain this storm was at our 7 o’clock. It pumped out a substantial wall cloud and then a nice funnel while we were speeding away from it. 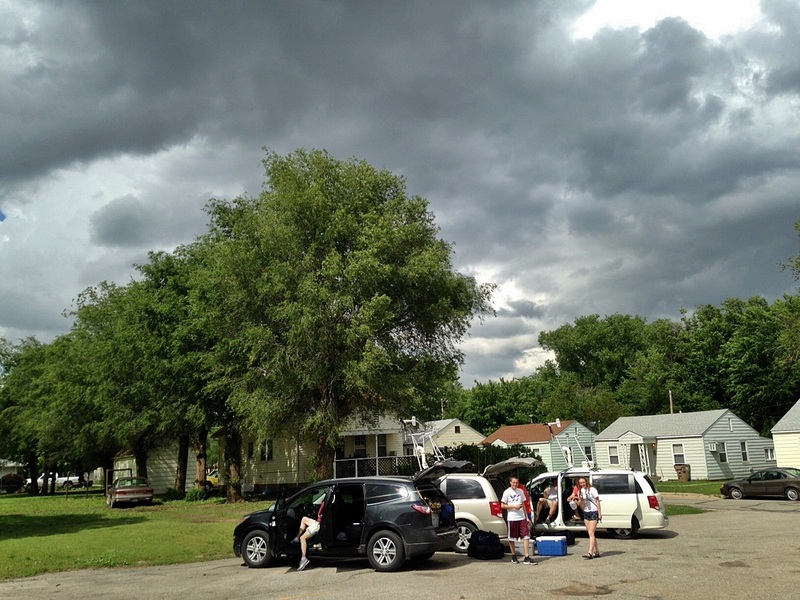 That meant only the folks in the back of the vans got a good look – and pictures – of it before the funnel dissipated. When eventually we came to a crossing route far enough ahead of the cell we dove in front to get south of its track. 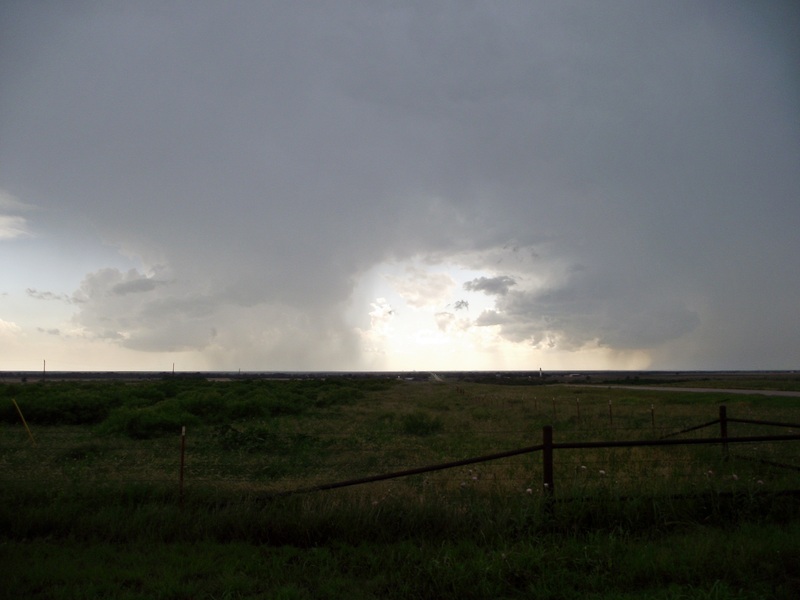 As we crossed its path we witnessed the very clear separation between the tilted rotating updraft and the precipitation shaft, a characteristic of a supercell storm. Punching back west a bit we pulled off the highway to observe this storm in hopes it would cycle back up. Unfortunately a very large cell south of the Red River chose this time to spew a strong outflow boundary in our direction which undercut “our” storm, weakening it. The silver lining in this was the passage of an active gust front that kicked up quite a bit of dust, accompanied by a massive shelf cloud. We followed this activity for a short while until it became obvious that the sheer number of storms was rendering chasing impossible. (We had anticipated this in our morning meeting.) Thus we pulled off these storms and rolled northward toward I-40 to obtain lodging and grab some dinner to assuage a number of growling stomachs. As darkness settled over us the mosquito swarm grew to epic proportions (remember all the rain that had fallen over Oklahoma?) so we escaped back into the vans to head north once again. Our collective frustration at having mostly missed the funnel under the earlier storm had vanished…but the hunger hadn’t! Our last day of chasing was to be Wednesday May 27th. The tentative status of the stranded van in Dumas TX was that the transmission parts would be provided to the dealership this day and the earliest we could pick it up was sometime Thursday. That would mean a long two day drive back to Blacksburg for a Saturday arrival. Thus during our morning meeting in Elk City OK we knew we needed to swing for the fences. It was – almost literally – the bottom of the ninth inning with two outs. After a relaxing time of eating, basking in the sun, and watching radar I ventured a couple of blocks to a convenience storm that had a bathroom (none available in the park). When I rounded the corner I immediately noticed puffy white updrafts bubbling to the west, an indication that our location was right on target. We waited a bit for the convective situation to unfold before jumping back into the vans. When one cell became dominant we rolled out of the park toward the action. The white arrows point to two separate rain-free bases, and what I quickly realized was this storm – due west of our position – was in the process of splitting. If the southern updraft intensified it would likely turn right, probably accelerating and changing to an east-southeast trajectory while leaving us in its tracks. Once we all agreed on this potential we climbed back into the vans and retraced our steps back to the southwestern route we should have taken originally. Unfortunately by the time we got ourselves straightened out the storm had indeed turned right and the precipitation (hail included) began encroaching on the road several miles ahead of us. However we could see a large wall cloud now under the rain-free base and when a funnel began taking shape underneath it we hurriedly pulled off the road to watch and snap photos. After this funnel dissipated without touching down we debated our road choices. The only real choice we had to get to the southern side of the storm without core punching was to retreat 40 miles east, catch a south route for 20 more miles, and then push back west. None of us were happy with this but we swallowed hard and did it anyway, hoping this storm would hold together long enough for us to get into position to watch it cycle. 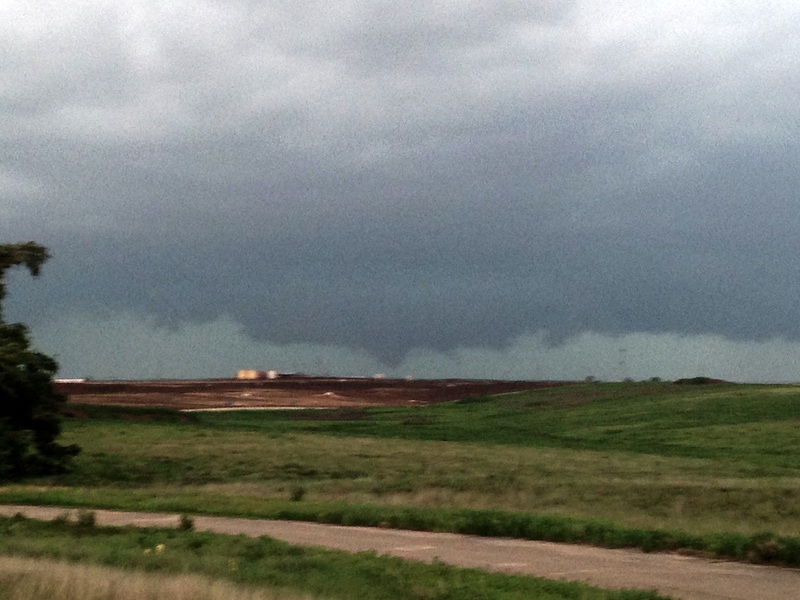 Overall this tornado was on the ground for 14 minutes and was rated an EF2 by the NWS Amarillo survey team. Unfortunately it injured three people and damaged some oil rigging. 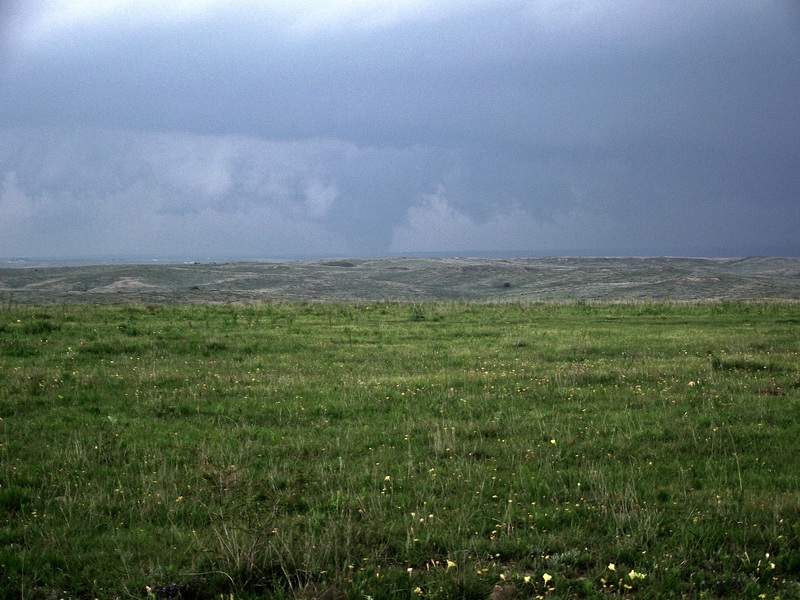 Overall this storm pumped out four verified tornadoes, and the time on this photograph roughly corresponds with the final tornado (rated an EF0). 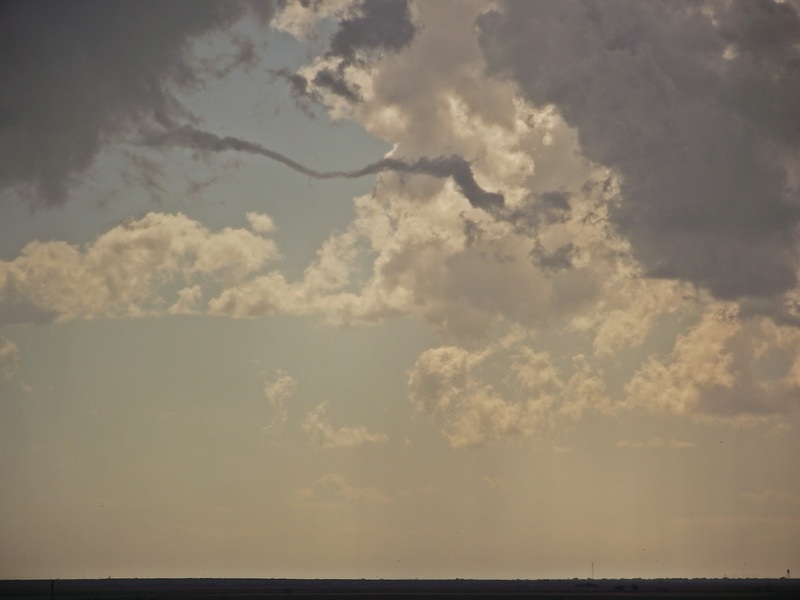 Thus this funnel could very well have had circulation on the ground that we couldn’t see. As darkness settled in we pulled the plug on the chase and began our long journey back to Blacksburg. That day may have been the bottom of the ninth with two outs but the bases were loaded and we’d just hit a grand slam. Not a bad way to end the chase! !